The patient needs to be in a sitting position. An elastic resistance strap is used to do this exercise. The patient is sitting on the table. The elastic resistance strap is attached to the table leg 10 cm above the ground. The other side of the resistance strap is attached around the foot of the patient’s affected hip. The patient performs an internal rotation. The patient should perform three sets of 20 repetitions on both the affected and unaffected side. When the strength test reveals that the affected side is weaker than the unaffected side, then the number of sets on the unaffected side needs to be reduced to two sets of 20 repetitions instead of three sets. Patients can experience fatigue in the posterolateral hip region when they are performing the internal hip rotation exercise. The internal rotation strengthening exercise needs to be performed daily and only on the affected side for two weeks. After two weeks the exercises will change to incorporate a more functional position for the hip joint. 2. The external rotation hip strengthening exercise. Same position as internal rotation but now the patient performs an external rotation. The strap is used to stabilize the thigh to prevent sagittal and frontal plane hip motion. This exercise can be used for the patellofemoral pain syndrome( See PFP). (Level of evidence: 2b). The patient should perform three sets of 20 repetitions on both the affected and unaffected side. When the strength test reveals that the affected side is weaker than the unaffected side, then the number of sets of the unaffected side needs to be reduced to two sets of 20 repetitions instead of three sets. Patients can experience fatigue in the anteromedial hip region when they are performing the external hip rotation. After two weeks of the strengthening program we do another exercise for two weeks. The patient is standing against the wall on one leg. The patient bears his weight on the affected side en he/she performs a series of mini-squats. The patient should maintain the external rotation of the affected hip so that the hip remains over the lateral portion of the foot/leg which is bearing the weight. This exercise should be performed two or three times a week with three sets of 20 repetitions on the affected side and two sets of 20 repetitions on the unaffected side. The patients need to stretch daily. The main stretches are: stretching of the hip flexor, the quadriceps, the lateral hip/piriformis and the hamstring muscles. The patients should perform more stretches on the affected side than on the unaffected side. They have to repeat them as often as they can throughout the day. They should keep stretching their muscles as long as they’re in pain. Wrap Thera- band around the thighs just proximal to the knee. Elevate the pelvis, with in the meantime abduction and external rotation of the hips. It’s important to avoid adduction and internal rotation while lowering the hip. Use theraband as resistance if patient is able to perform 3 sets of 15 repetitions without resistance. Wrap Thera-band around the thighs just proximal to the knee. Stand on a step stool. Hang one leg off the step and keep your abdominals tight and your pelvis horizontal. Let this leg slowly fall towards the ground by allowing your pelvis to slowly drop down. Drop your pelvis down as far as possible (your foot may not touch the ground) and hold this position for two seconds. After these two seconds, raise your pelvis up by using the hip muscles in your support leg. Repeat this exercise a few times (10-15). If it becomes easy to perform, you can hold a dumbbell to add resistance. During the execution of this exercise it’s important to hold you’re back straight and your abdominals tight. Your support leg should also remain straight. This exercise is to stretch the hamstrings. You can use this with shortened or stiff hamstrings. Straight leg raise test: The patient lays on his back in front of a wall. The hip is in neutral position (the hip angle can vary). Then he/she places his heel against the wall. The passive tension is applied by gradually increasing the hip flexion angle (Level of evidence: 1b) The patient holds his leg, without moving, during 10 seconds in the air against the wall. After the 10 seconds, the patient needs to bring his leg slowly to the floor. The patient repeats this exercise 4 x 10 seconds. Remark! The patient needs to stop raising the leg when his pelvic rotates. It’s a kind of compensation.The value can be measured with three instruments: Goniometer, flexometer and tape measure. (Level of evidence: 4) This exercise can also be performed as a passive exercise. The patient needs to lay on a table. The hip needs to be extended 180°. Now it’s the therapist who raises the leg from the patient, as high as he can. (without compensation! Without pain!) Duration: The therapist holds the leg in the air for 10 seconds and repeats this 4 times. Phase 2 (week 4-9) contains weight – Bearing strengthening exercises. 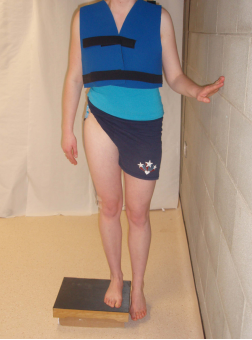 The patient started initially with double-limb weight-bearing exercises. Afterwards the patient performed single-limb movements to multiply the demands on the hip musculature. This phase included four exercises. The first exercise was a squat maneuver (figure 5A) performed with the thera–band resistance, which was applied around the thighs just proximal to the knees. The squat was first executed to a depth of 45° and later on to 75 °. During the second exercise the patient performed a sidestepping exercise with Thera-Band (figure 5B). The patient began the exercise in a squat position of 45° of hip and knee flexion. Subsequently he took steps to the right and the left along a 10-m walk-way by abducting and externally rotating his hips. It is important to keep the trunk erect during exercise and to avoid knees over toes. The next exercise, named single – limb sit to stand, was executed in a manner similar to the squat (figure 5C). The patient performed the exercise first from a 70-cm (measured from the floor to the top of a treatment table) high surface and finally when he could execute 3 sets of 15 repetitions, the height was each time reduced with 4 cm, to a final height of 58 cm. The last exercise called the step-up/step-down exercise (figure 5D). The patient used a 20-cm-high step stool. The exercise was performed by touching his heel to the ground and returning slowly to the start position over a 3- second period. First the patient had contralateral upper extremity support. This support was removed when the patient was able to control his hip motions and to perform 3 sets of 15 repetitions. ↑ 3. Nugteren, K. v. (2007). Addendum: tendinose van heupabductoren als oorzaak van het trochanter major pijnsyndroom. In D. W. Koos van Nugteren, Onderzoek en behandeling van de heup (p. 82). Houten: Bohn Stafleu van Loghum. ↑ 9.0 9.1 9.2 9.3 9.4 Tonley JC, Yun SM et al. Treatment of an Individual With Piriformis syndrome Focusing on Hip Muscle Strengthening and Movement Reeducation : A case report. Journal of Orthopaedic Sports Physical Therapy 2010; 40(2): 103-111.